The other week Paul Stewart suddenly noticed that the Willesden was in with a realistic chance of regaining the Audax UK Club Championship* and it was decided to discreetly organise an end of season points grab, to try and make sure. 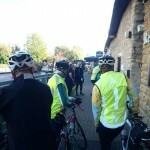 So on a glorious late October Saturday, 11 Willesden audaxers and 2 Westerley club members met up at the McDonalds across the other side of the Hayes Bypass from the Hillingdon Circuit to ride a new 200km “Permanent” called the “Boat Ride” based on Liz Creese’s Autumn Assortment ride. Naturally we started slightly late, but the first leg dash up the Uxbridge Road and along the well trodden path via Bottrells Lane and Butlers Cross to Waddesdon went quickly, despite the rough roads causing the odd shedding of handlebar furniture. Eythrope Park looked glorious in the autumnal sun and we passed a big club group going the opposite way. The consensus was it was Milton Keynes but their shirts were so loaded with sponsors’ wording it was hard to tell. 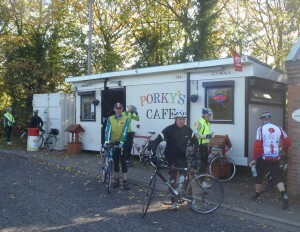 After we packed out the Toulouse Café, now renamed Porky’s, for fortification by baked beans, the two clubs unintentionally split. Busy traffic as we got back on the A41 strung us out and despite some lung-busting shouting to stop and turn, the Westerley contingent headed off towards Bicester not to be seen for another 3 hours. With a steadily rising tailwind, a more leisurely pace was maintained to Helmdon, north of Brackley, with a quick drinks and crisps stop at the village pub. Martin Lucas and your correspondent were asked by a regular if we had just cycled from Willesden in Yorkshire, a mythical place neither of us had heard of before. The drag up the hill on the A5 out of Towcester into a strong headwind was a harbinger of things to come and we regrouped for a late lunch at the Boat pub, next to the canal lock at Stoke Bruerne. Just as we were finishing, the Westerley caught us up, so we promptly set off into the headwind. We started a paceline, but somewhere it split and it was a group of just six of us who arrived at the by now closed canalside café in Cheddington. Fortunately the tea towel shop stocked chocolate bars and drinks, so we stood around and munched in the last of the day’s sun. 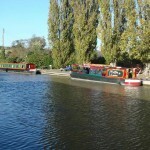 A wedding party had booked a narrow boat from there but set off without some of the guests who’d disappeared. Just as we were climbing on our bikes a very well oiled set of missing guests appeared: they didn’t seem too concerned about missing the boat. A ride back to Hillingdon in the dusk and the dark followed. Buckinghamshire road surfaces are bad enough in daylight, after dark when you can’t easily see the ruts and holes, they’re positively scary on thin road tyres. A quick Mcflurry to get a receipt to prove arrival and then for most riders it was on to the Brilliant Restaurant for a well-earned Indian after what turned out to be a surprisingly hard ride. 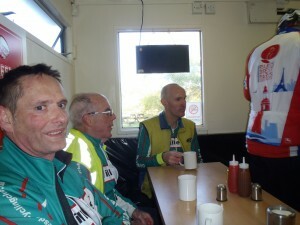 It wasn’t just old Audax sweats riding, four members who have joined the club this year, took part: Els Vermeulen, Richard Jennings, Steve Roffe and Tim Sollesse. 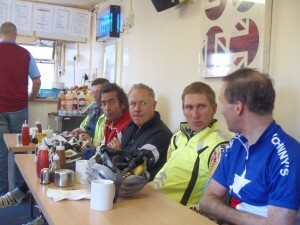 Finally, a big thank you to Paul Stewart who put a lot of effort into organising the ride at short notice. It has all the makings of an annual event. Liam Fitzpatrick on 41 points may pip Ivo for 6th spot. This entry was posted in Audax. Bookmark the permalink. I wonder if I got any AUK points for my 700k in the 24hr TT or the 12hr? Do TTs count? Do I need to be registered with AUK to get those points? Actually, since I’m asking, is there any way to claim any of the training rides I did that were over 200k (quite a few of them leading up to the 24hr). Liam you must be the 6th as Ivo didn’t pay his subs this year. !